LENTILS WILL FILL YOU UP WITHOUT MAKING YOU FAT + GIVE YOU TONS OF ENERGY! They are also extremely versatile, taking on different textures and absorbing flavors easily. 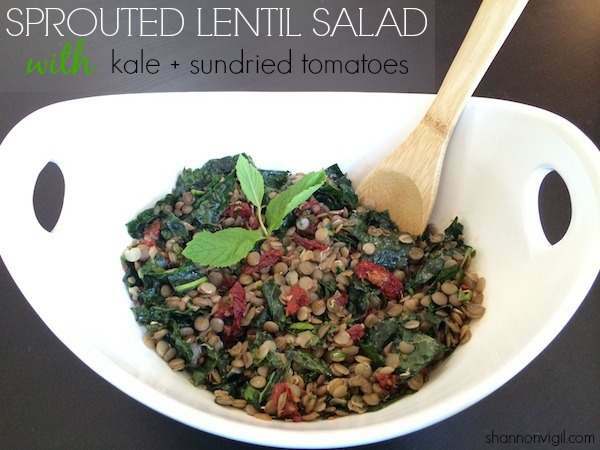 In this recipe I used sprouted green lentils, by TruRoots. Sprouting makes lentils even more nutritious and convenient, ready in 15 minutes or less. Of course you could use regular green lentils as well, but if you’re short on time I recommend trying this brand as they are non-GMO and organic. Now for the recipe! Add the sprouted lentils to 4.5 cups boiling water in a medium saucepan. Boil gently for 5 minutes. Cover and simmer on low for another 7-10 minutes, depending on the texture you like. Drain if necessary. While the lentils are cooking, cut kale into ½ inch strips and massage with your hands for a couple of minutes. Drain the sundried tomatoes from the jar, chop and combine with kale in a medium mixing bowl. Add the chopped mint and parsley as well and set aside. Prepare the dressing by adding garlic, olive oil, balsamic vinegar, lemon juice, sea salt and pepper to a glass jar with a tight-fitting lid. Shake it up vigorously to combine the ingredients. You’ll have extra dressing for later in the week! Add warm, drained lentils to the kale mixture along with 4-5 tablespoons of the balsamic dressing. Toss to combine and serve warm or store in an air-tight container for up to 4 days. I think this dish tastes better the longer the lentils sit in the dressing! Great as a side dish or take leftovers for lunch for a complete meal. Wishing you lots of energy!